".... But a brick-red walrus with real ivory tusks and wrinkled skin, lolling on a rock near Old Head, within a stone's throw of grazing sheep, oblivious of holiday traffic and, praise be, young Mr Paul Cotter's camera, was almost surrealistically disturbing. Walruses belong in the Arctic, with the polar bears. The only ones l've ever seen close up were chivvied off an ice floe in East Greenland by a helicopter's brutal wind. 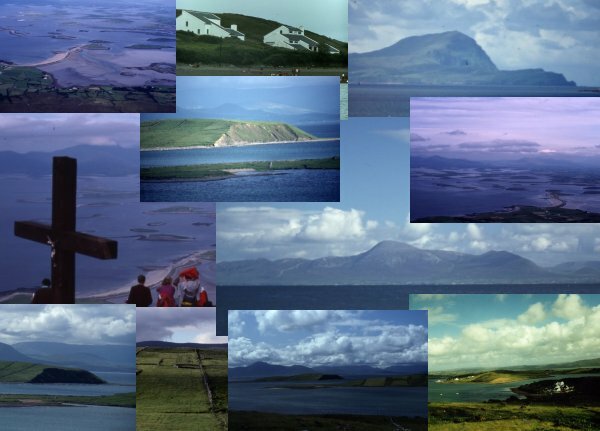 And now a walrus has spent an Easter Saturday afternoon (1999) on the shore below Croagh Patrlck, its snooze snapped in Fujicolor for the edification of science. A "rare vagrant'' - but how rare is rare. One was seen in the Shannon in 1897, one was shot off Co Kerry in the 1920s: two records in a century. But in the past 10 or 15 years, the number of sightings has been growing..."
Walruses are not tame as the following story shows. This took place in Franz Josef Land which is in the Arctic about 1,300 miles further north than Ireland and much more the sort of place where you would find a walrus. Nansen and Johansen, two Norwegians who had been trying to reach the North Pole were on their way back home in August 1895. 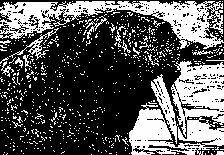 "After Nansen and Johansen had been under way for some time, a walrus, heavily tusked, surfaced close by their (kayaks), glaring inquisitively, or menacingly at them. They ignored the obese monster. They had food enough, and merely wanted to advance. The walrus objected. And when Nansen and Johansen tried to drive it away with their oars, it became enraged. Puffing and snorting, it threatened to hole their kayaks with its tusks. Reluctantly, Johansen, in self-defence, had to waste a bullet ......."